scans_daily | Marvel's EMPIRE STRIKES BACK: Adventure. Excitement. Also, this was a "corrected" version where Yoda doesn't look like a tiny purple elf with white hair. Yoda is right about Luke wanting adventure and excitement... to a point. Bored Farmboy Luke Skywalker wanted adventure. Commander Luke Skywalker, part of the Alliance to Restore the Republic, wants to defeat the Empire and restore the Republic. Luke "looked away to the future" because he was unhappy working on a moisture farm. As part of the Alliance, Luke knows the Empire has to be defeated. Luke mostly wants to be a Jedi because of his father, but he also wants to help his friends. 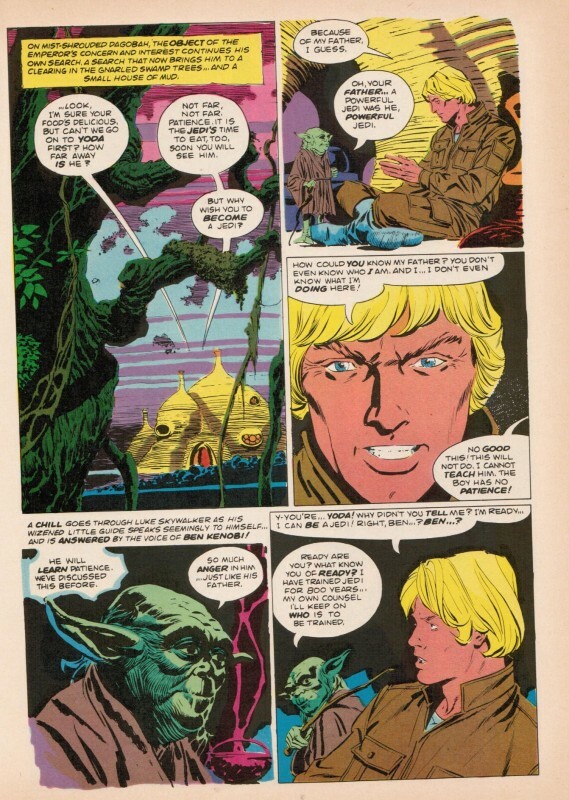 Yoda talking about Luke just not being right for Jedi training is probably another test. (After first testing how Luke would react to an odd alien rummaging through his stuff and "fighting" Artoo.) But it is a test for how Luke was at the start of A NEW HOPE, not about how he is as part of the Rebel Alliance. Luke might say something to Rey at the start of THE LAST JEDI about how similar they are. "Like you, I didn't want power just for myself. I wanted to help my friends win a war they couldn't afford to lose. And it all worked out great. For a while." I'm, reminded of a moment in the ROTJ comic, were Obi Wan's force ghost explains how he first meet Anakin when he was a pilot in the Clone War. That's all I've got. Help me Pablo Hidalgo, you're my only hope. At least this time Yoda didn't complain about his student being too old to train, the way the Jedi Council did with Anakin, who was less than half Luke's age here. I must dig out the recent Star Wars issue where Luke reads some Jedi history about a mission where the Council sent their most respected Jedi Knight to deal with a warlord holding a young Force sensitive as a slave, and Luke is wondering just how amazing a warrior he must have been, and of course, the big reveal to the reader, which Luke never gets since it's a text story he's reading and no names are mentioned, is that it's a certain elderly green frog-goblin. I don't know. I'd argue that Yoda wasn't testing Luke's commitment, but his patience. Not whether or not he was willing to fight the Empire, it's pretty obvious that he was, but whether or not he was willing to accept that the Jedi training would take a lot of time and effort and that he wouldn't get results instantaneously. Which he ultimately wasn't as he proved when he ran off to go save his friends over Yoda and Obi-Wan's warnings. I don't think he wasn't willing to accept that, but the fact remained that his friends were in danger, and Jedi or not, he knew they needed his help.